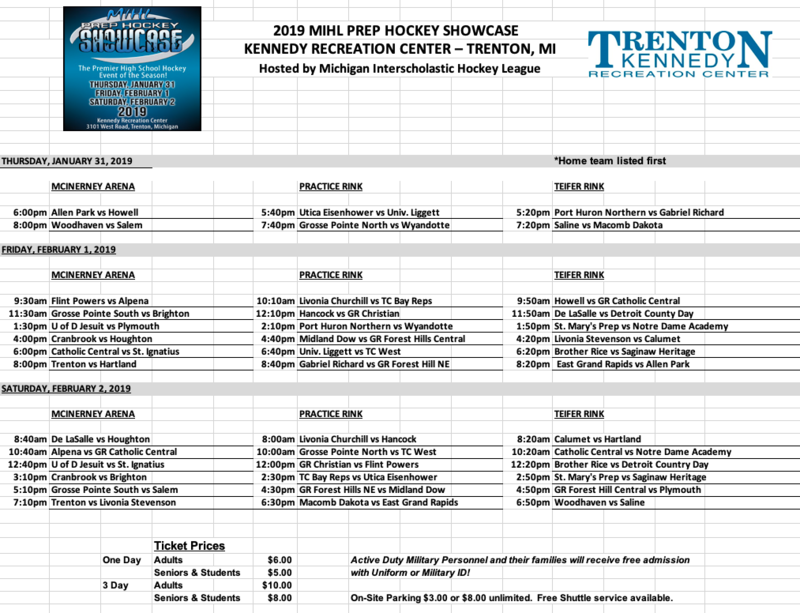 The 19th annual MIHL Prep Hockey Showcase is almost underway in Trenton. One of the highlights of the high school hockey season each year, this year’s MIHL Showcase is set to fill up the Kennedy Ice Arena from Thursday, Jan. 31 through Saturday, Feb. 2. Teams from Michigan, Wisconsin and Ohio will all be in Trenton for the three-day event. The competitive level is always high; for the 2019 showcase, six of the ranked teams in Division 1, seven of the top 10 in Division 2 and nine of the top 10 in Division 3 will all be partaking. Last year, two of the three MHSAA championship teams – Brighton and Hartland – competed in the event, while five of the state finalists and nine of the semifinalists all appeared at the showcase. This year, Detroit Country Day, Alpena, Howell, Macomb Dakota, Woodhaven, Forest Hills Central and Midland Dow return to the showcase.